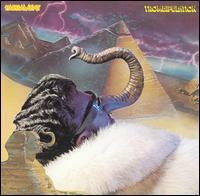 Trombipulation is a 1980 album by the funk band Parliament. It was released by Casablanca Records. It was the last album of original material produced by the group. Unlike previous Parliament albums, George Clinton did not serve as sole producer of the album, as other P-Funk figures assisted in producing individual tracks. Bassist Bootsy Collins emerged as the principal musician on this album, playing virtually all of the instruments on a number of tracks. The track "Let's Play House" was sampled by the Hip-Hop group Digital Underground for their single "The Humpty Dance".